The mooted amalgamation of Britain’s Carillion and Balfour Beatty might qualify as a merger of equals, but only because Balfour has fallen on hard times. The difficulties of the once-larger construction and infrastructure management company pose a serious threat to the success of any combination. Balfour issued the latest in a string of profit warnings on July 3. It is without a chief executive after Andrew Naughton stepped down in May. At 10 billion pounds, Balfour’s revenue is two-and-a-half times that of Carillion, and Thomson Reuters Eikon data shows that Carillion’s five-year average operating profit margins of 4 percent were double Balfour’s. In the most recent 12 months, the numbers were 4.5 percent for Carillion and a meagre 0.5 percent for Balfour. Investors have responded to the diverging trends. Balfour shares have lost one-third in the last three-and-a-half years while Carillion stock has added 30 percent in the last two. The market capitalisations are now close enough that each company could contribute half to a venture with a market value around 3.4 billion pounds. Shares in both companies rose smartly as news of the tie-up talks emerged. Investors probably think a deal is likely. They may see gains from combining complementary business outside Britain. Carillion’s expertise in facilities management, including projects taken under the UK’s Public Private Partnership initiatives, may also dovetail with Balfour’s heft in construction. Friday’s share price buoyancy also reflects expected cost savings. The companies haven’t yet provided estimates, but comparable deals have delivered savings of around 2 percent of relevant revenue. For Balfour and Carillion, which have overlapping businesses in the UK, that suggests annual synergies of around 100 million pounds. Taxed and capitalised, these would have a net present value of around 700 million pounds – twice the amount added to the pair’s market values on July 25. That gap makes sense, since the deal is not yet done and the synergies are only potential. Yet it might not be big enough, since there is a risk that operational misfortunes – whether inherited from Balfour or created in the melee of crunching two companies together – could drag down the larger group. A Balfour Beatty worker walks onto a site in London. Carillion and Balfour Beatty, two London-listed construction and infrastructures services companies, are in merger talks. If completed, the combined entity would have a market capitalisation of around 3.4 billion pounds ($5.8 billion). Shares in Carillion rose 10.4 percent to 373.7 pence by 1045 BST. 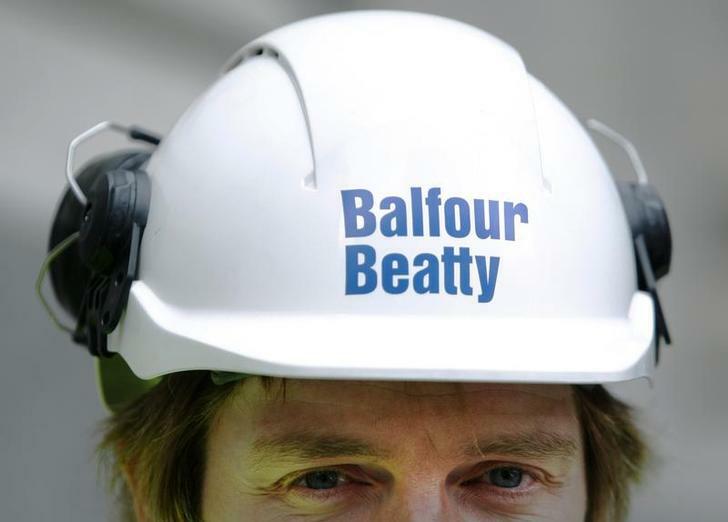 Shares in Balfour Beatty rose 9 percent to 253 pence by the same time.